Foreign trade followed by ship building boomed in the 17th, 18th and 19th centuries but crashed in the 1980s. 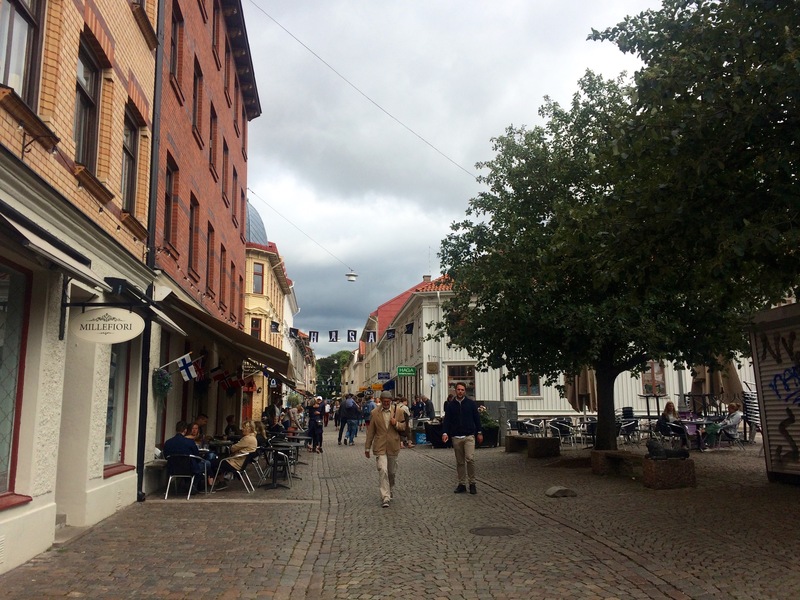 Today commerce and industry (such as Volvo) generate the income for the residents. 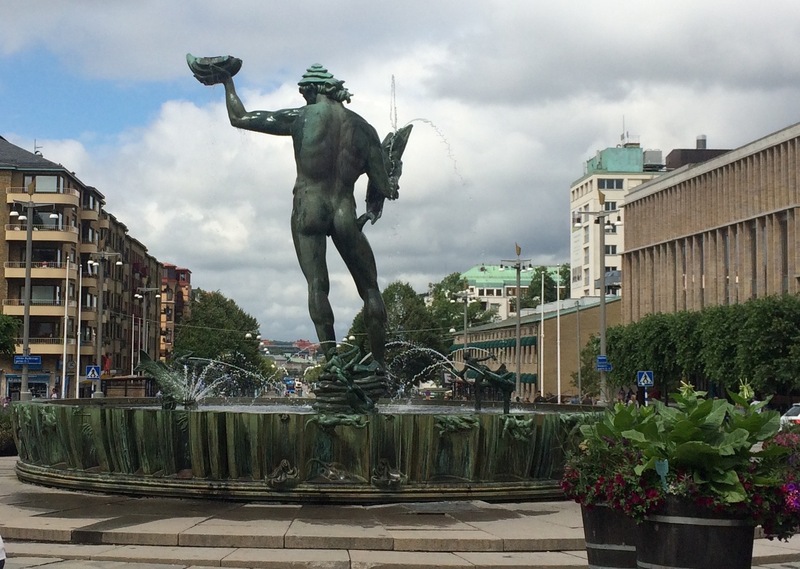 The Avenyn, a long boulevard, stretches to a lovely art museum, the Kontsmuseet. 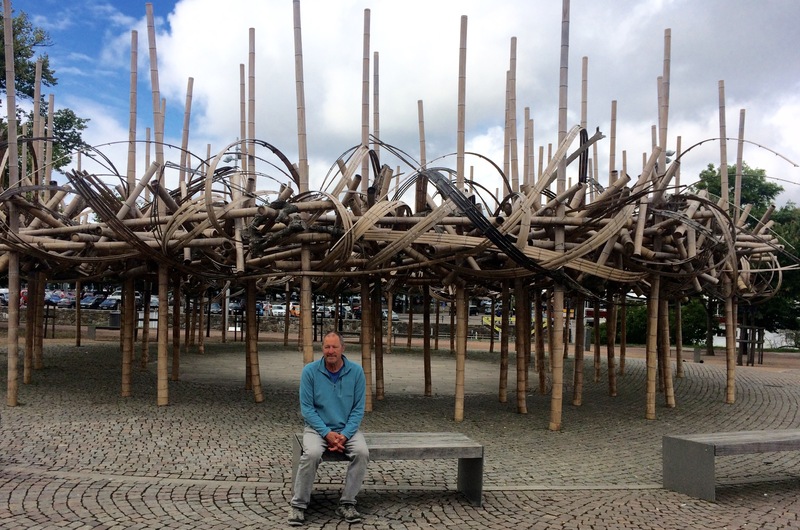 We joined others walking around (it was a lovely day), passing “The reincarnation”, an interesting green sculpture by the Japanese Installation artist Tetsunori Kawana. Michael had given us directions saying all we needed to do was mention we wanted to go to the Poisiden. No wonder as this statue stood arrogantly gazing down the Avenue as it guarded the museum’s doors behind hit. 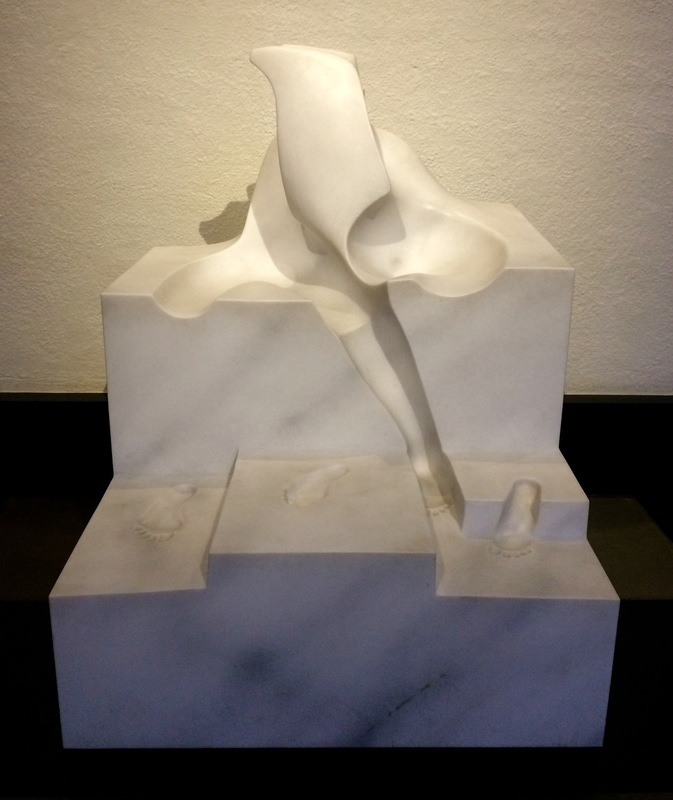 to contemporary sculpture with a twirling fashionista modeled in styrofoam and covered in plaster. Bizaare and a bit mesmerizing to watch. 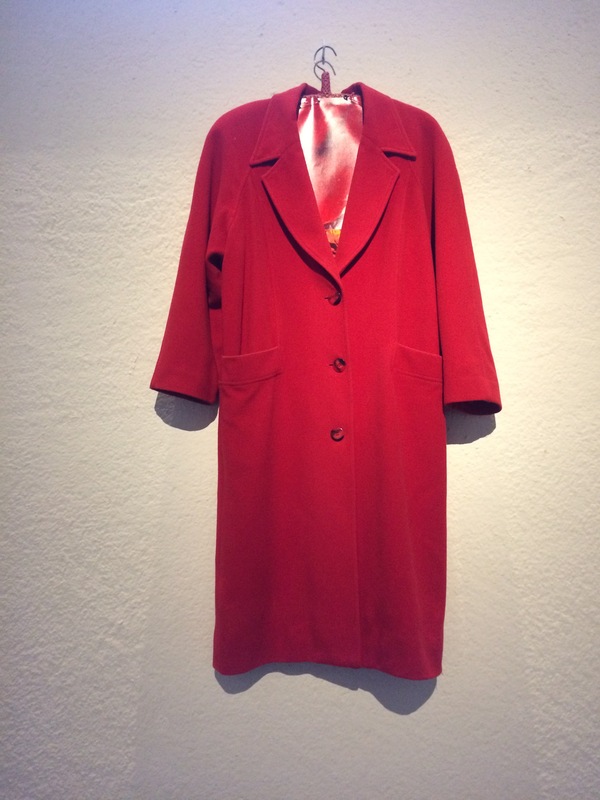 Of course, what’s modern art without something, well, some thing such as this piece by Lenke Rothman (1929-2008) called “Dedication. 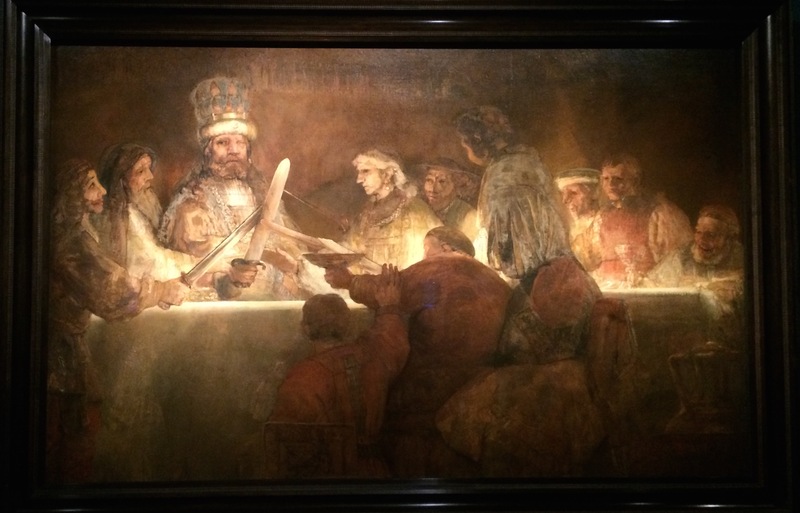 To El Greco and his Benefactors in the 1500s”. You figure it out. I moved on. 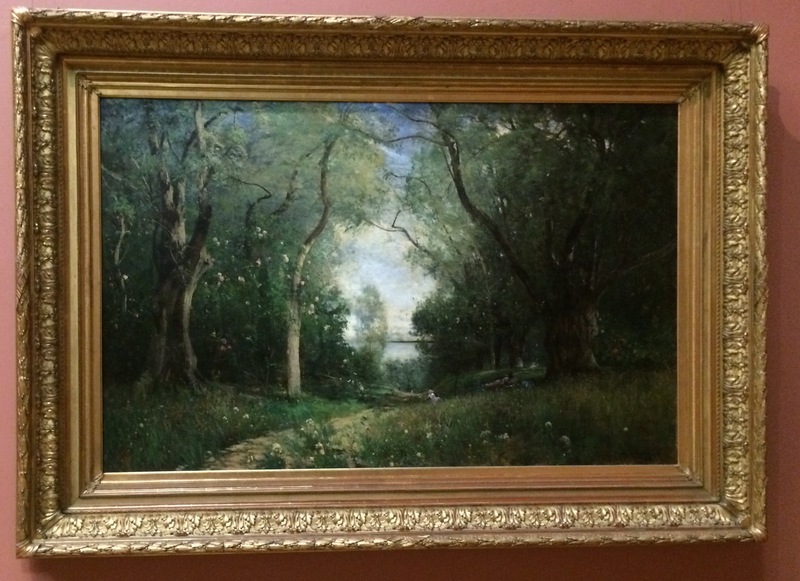 We also saw some well-known French Impressionists (Degas, Monet, Van Gogh, for instance). 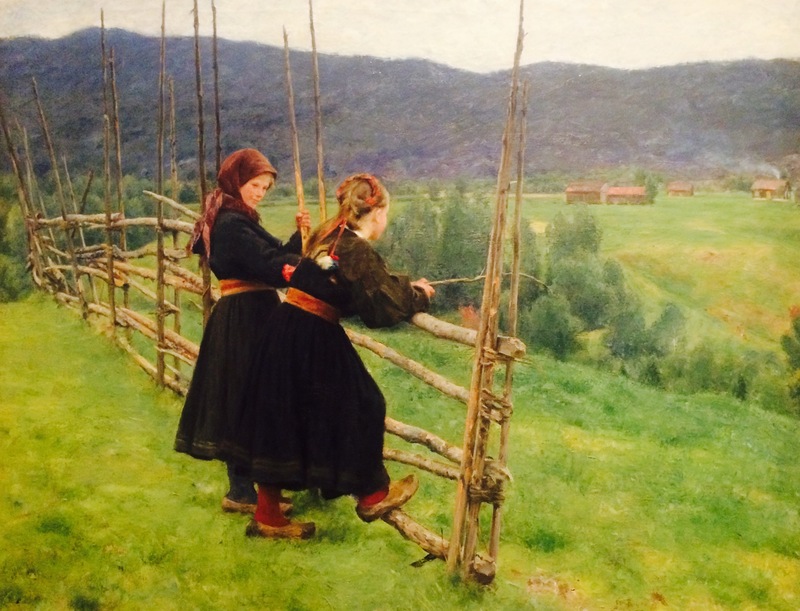 which is a sister painting to one I saw and loved in Oslo. 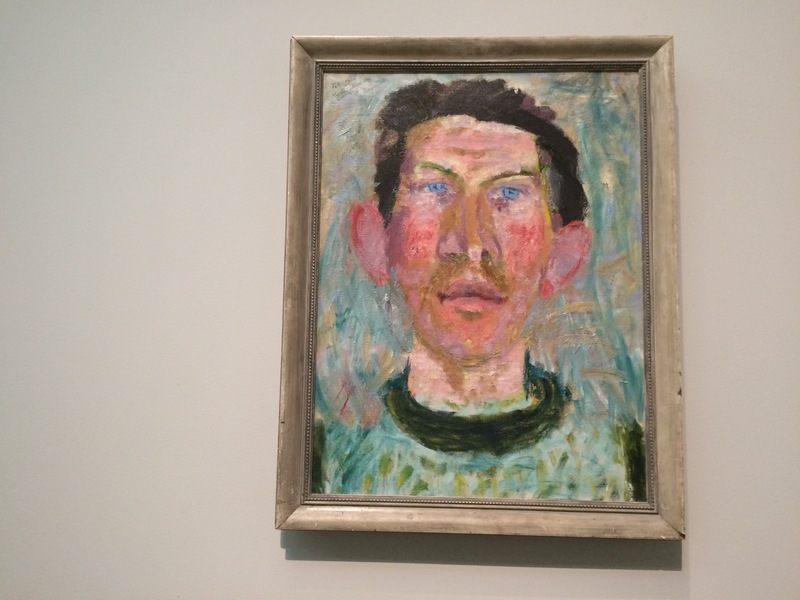 We’ve actually stood where he painted this gentleman in Kragero. 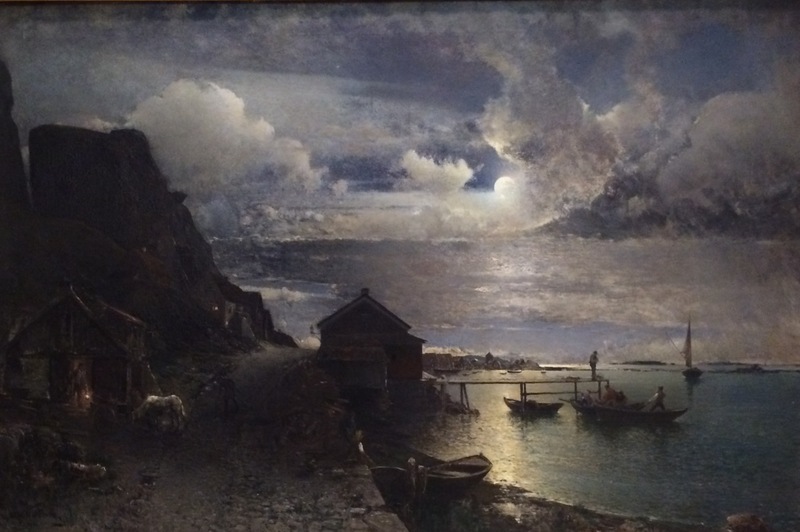 He even painted this gallery in 1885. 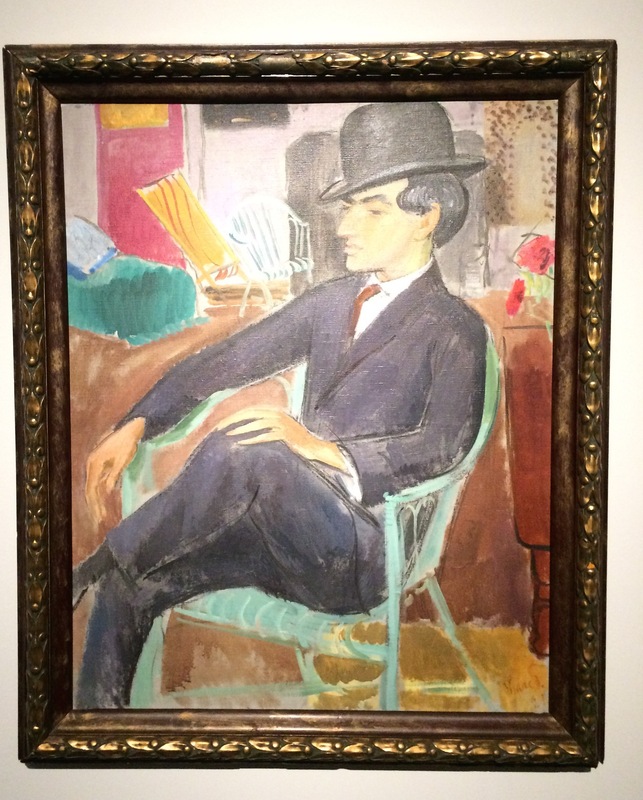 It was easy to recognize some of the work hanging both in his picture and in the actual room. 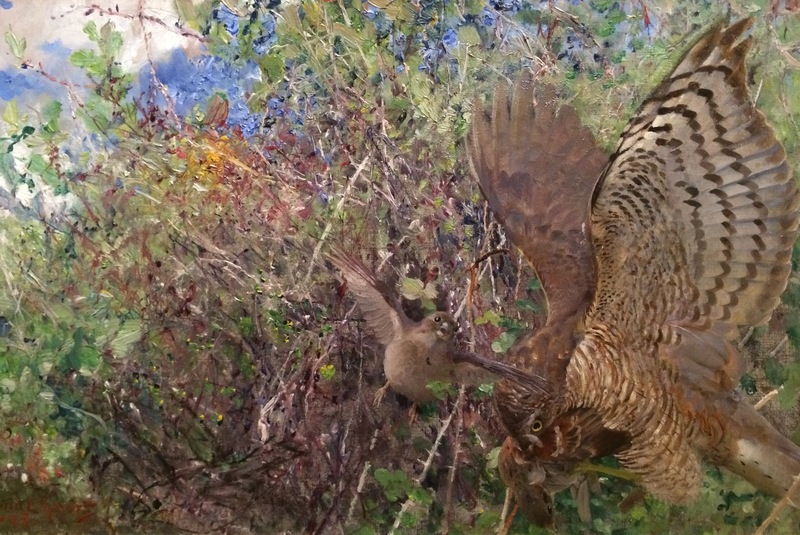 Look at the detail in this painting of a birds (1888). 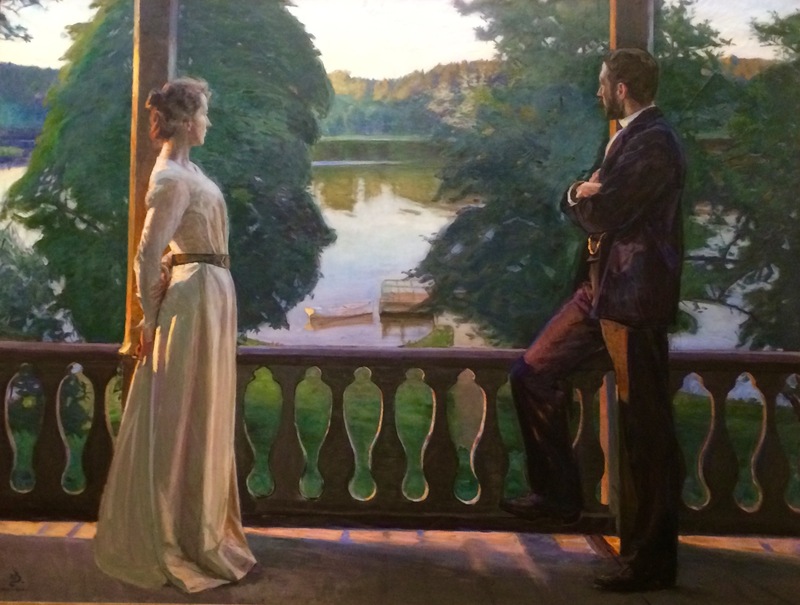 This artist represents the Opponents’ Movement, members of the Artist’s Union who opposed the Royal Academy of Art in Stockholm. Luckily for them, Pontus Furstenberg supported them. 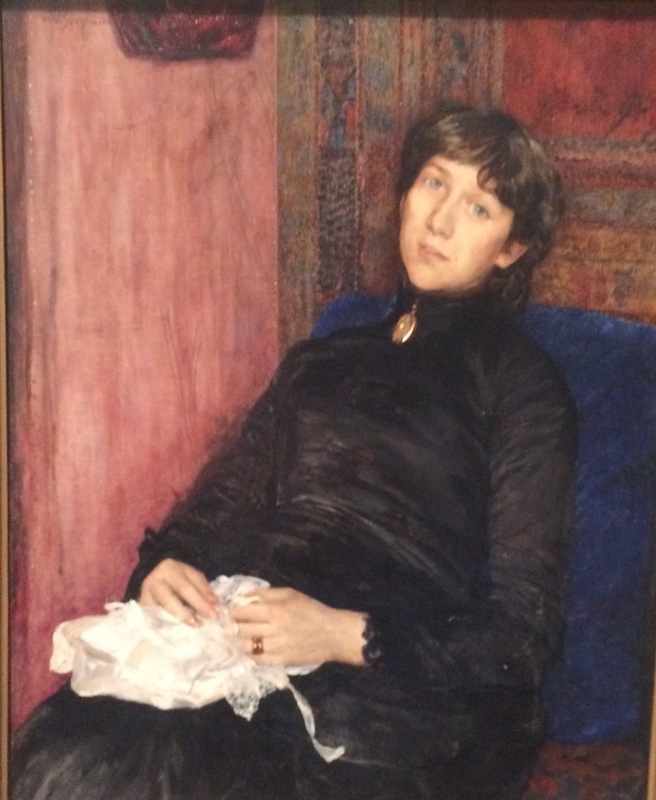 His portrait of “Nennie al Geijerstam” (1885) perfectly captures someone who appears relaxed and resigned to have her likeness immortalized in oil. Can’t you just see her saying “What? Again?!” ? 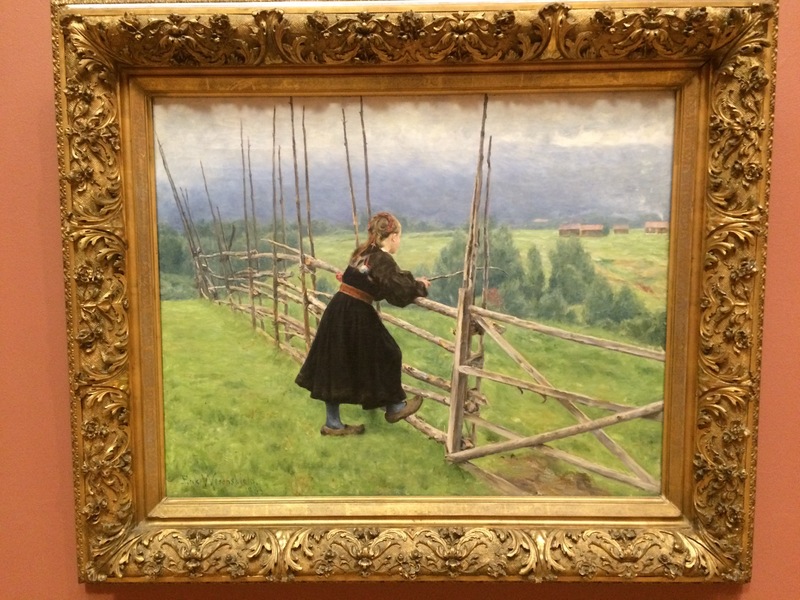 As did his “A May Day, Nice” (1878). Speaking of catching my eye, this artist’s “Hip, Hip, hurrah! 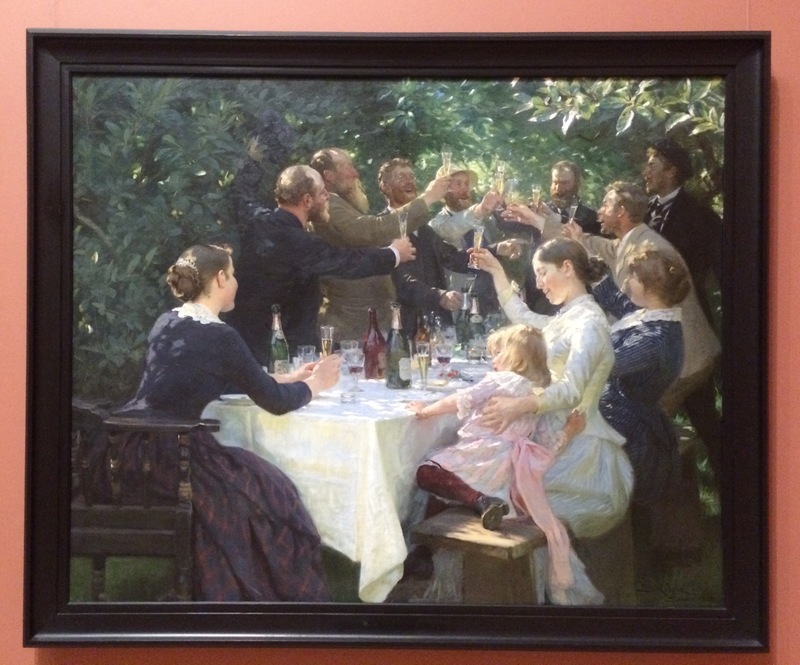 Artists’ Pary, Skagen” (another town we almost visited this summer) (1888) features the painter himself an other artists/friends– standing, starting from the left: Martha Johansen, her husband Viggo Johansen, Christian Krohg, the parinter himself P.S. 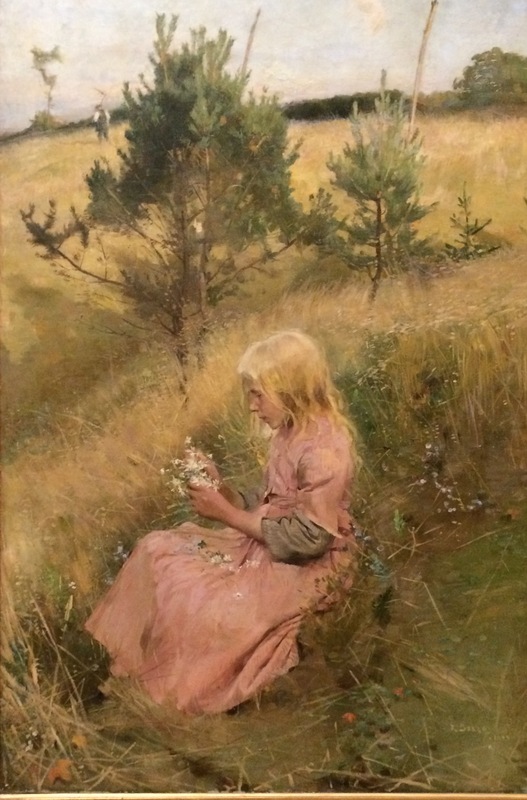 Kroyer, Degn Brondum, Michael Ancher, Oscar Bjorck and Thorvald Niss; Sitting, Helene Christiansen and Anna Ancher with her little daughter. 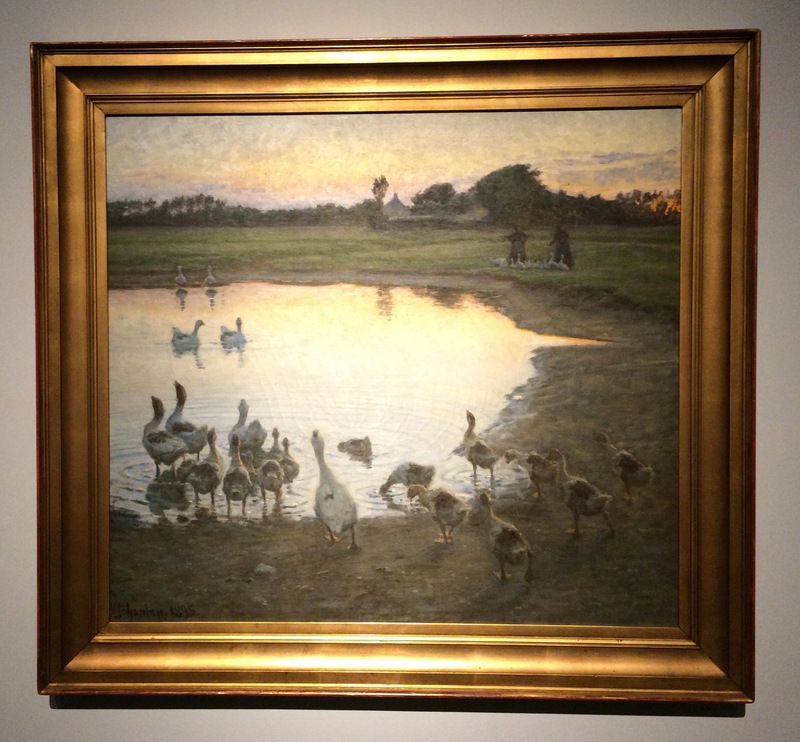 His “At Sunset” (1895) captures a stillness in spite of what must have been filled with a lot of quacking when he painted it. 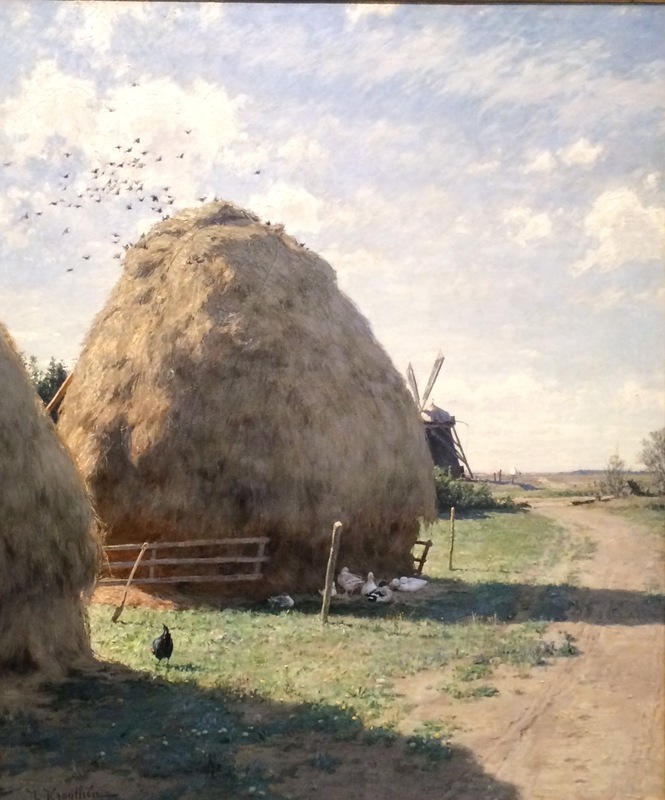 I love the radiance in this “Haystacks, Summer Scene from Skagen” (1884). 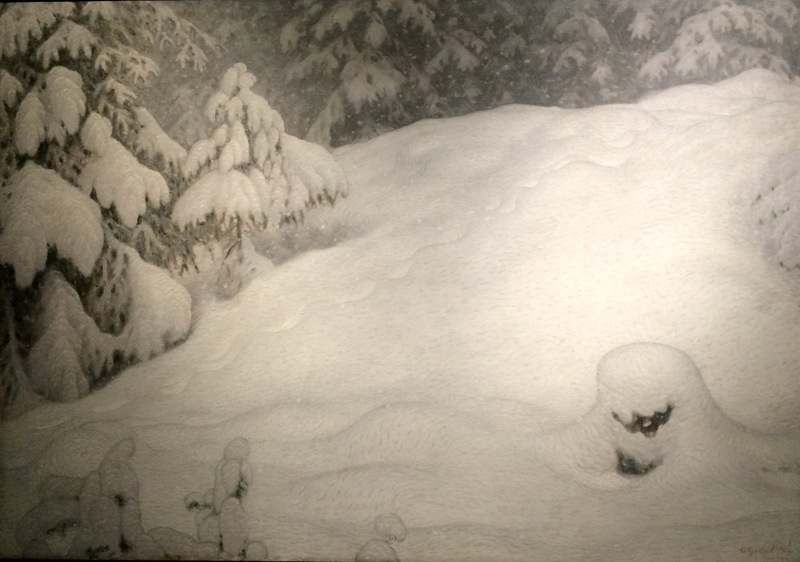 My photo doesn’t do this justice but it certainly brought winter into summer with his “Snow” (1900). More rooms and more artists continued to draw my eyes. 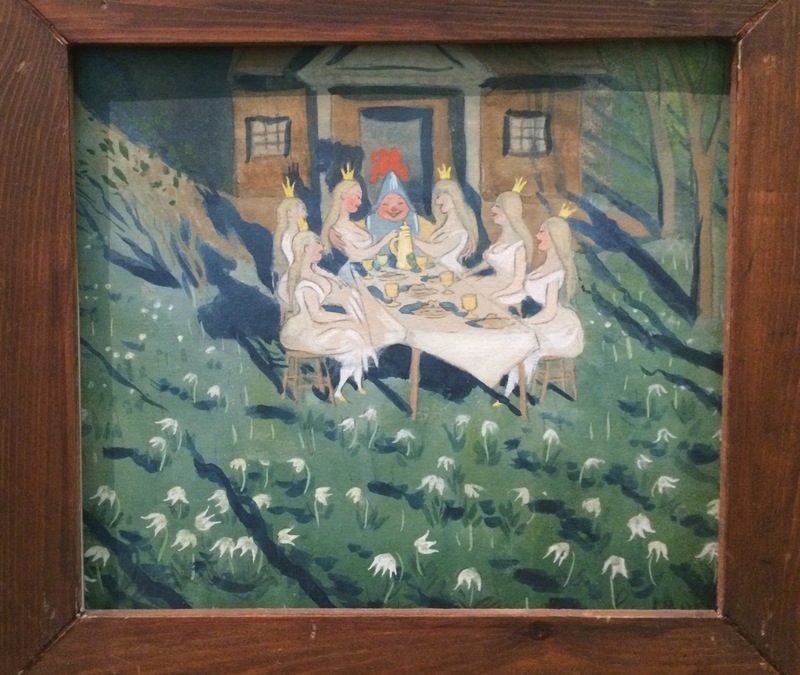 Ake Goransson (1902-42) was a hairdresser by training but pursued art studies as well. 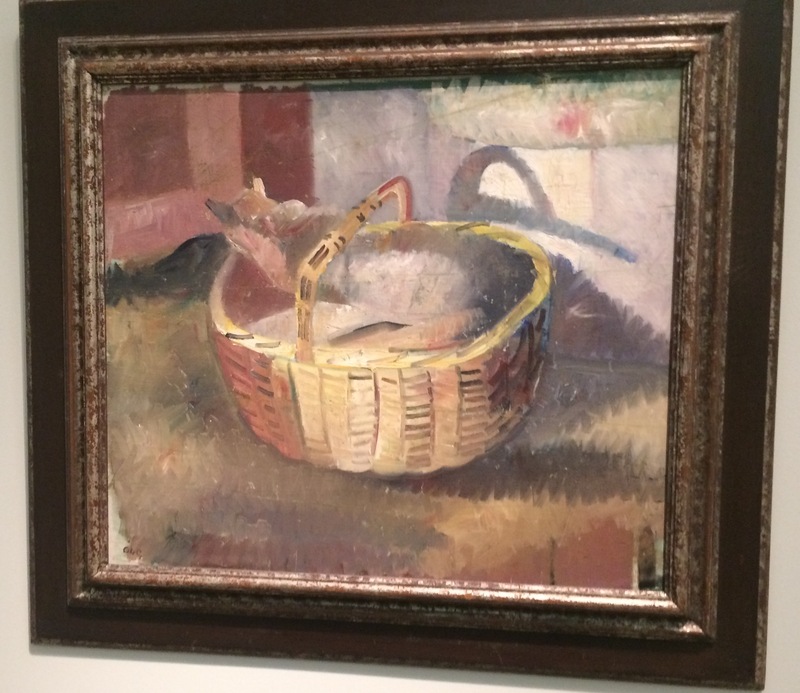 In the early ‘30s he isolated himself and his mom in a small, one-room flat and proceded to paint still lifes, interiors (no kidding), and street scenes viewed from his window. He was admitted to a hospital in 1937, and his mother burnt thousands of his drawings yet kept some paintings hidden in the kitchen sofa. They were discovered in the 1940s. 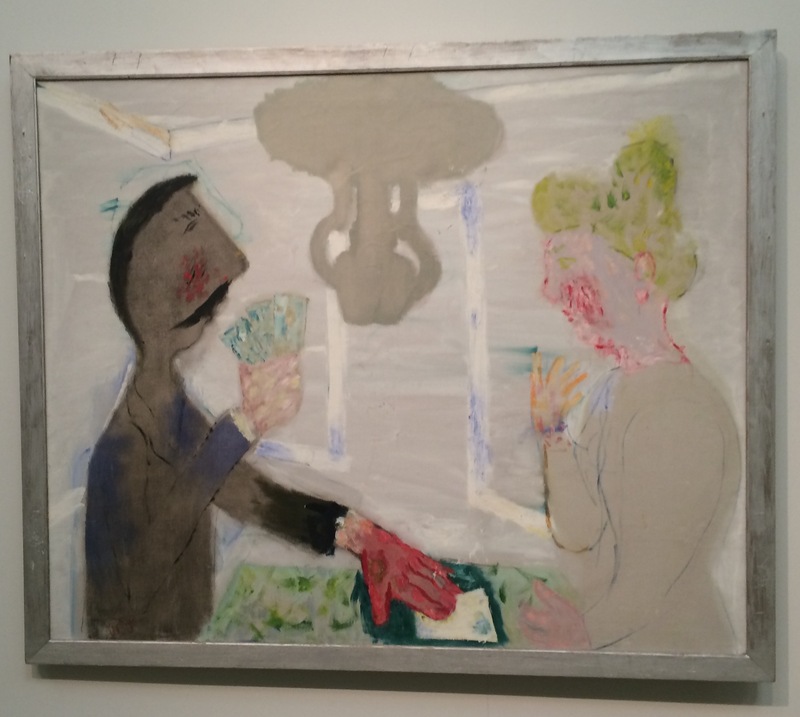 But his watercolor of “Self Portrait with Poultry and Pigs” places him in a friendlier scene but doesn’t appease his broodiness. 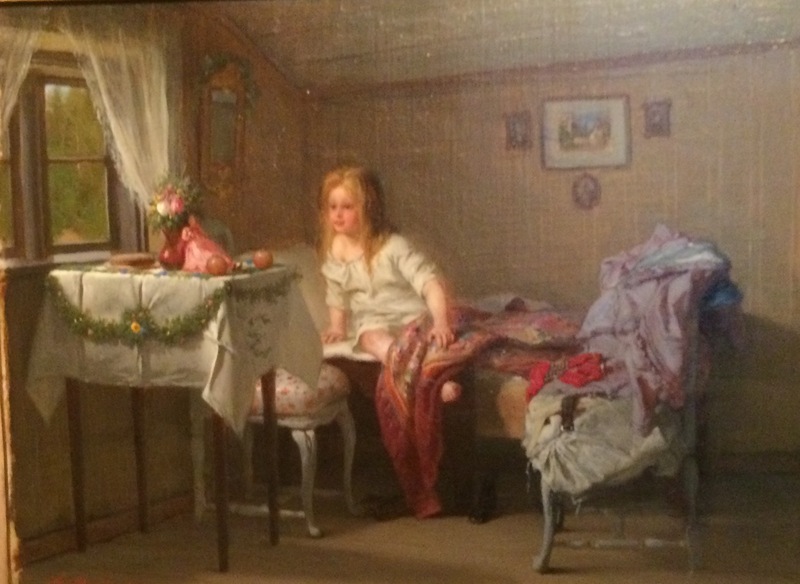 Moving onto a much more innocent-looking scene: August Malmstrom’s (1829-1901) “The Little Girl’s Birthday” made me want to create a similar surprise birthday morning. 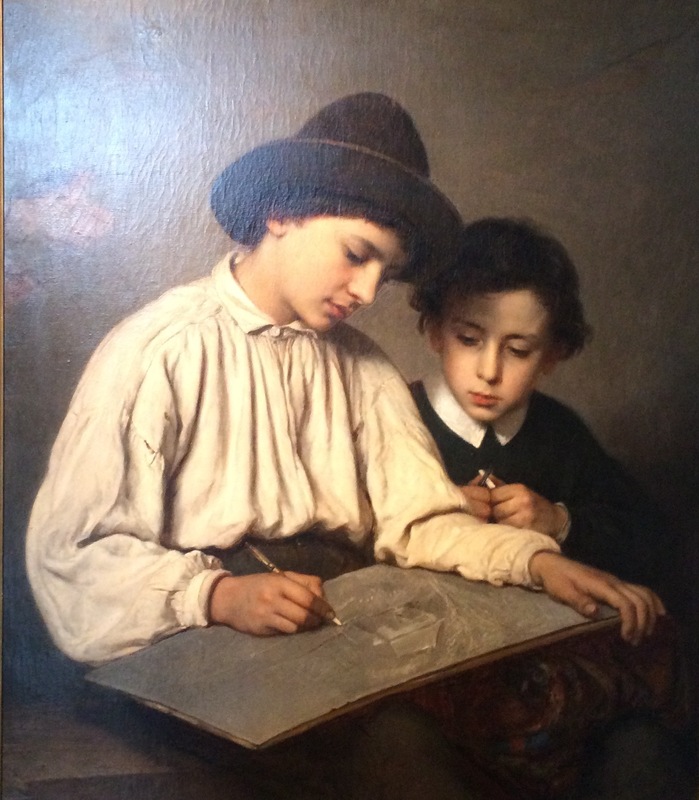 Sofie Ribbing’s (1835-1894) “Boys drawing” (1864) produces a a pin-drop quietude. I found myself almost tiptoeing past so as not to disturb their concentration. 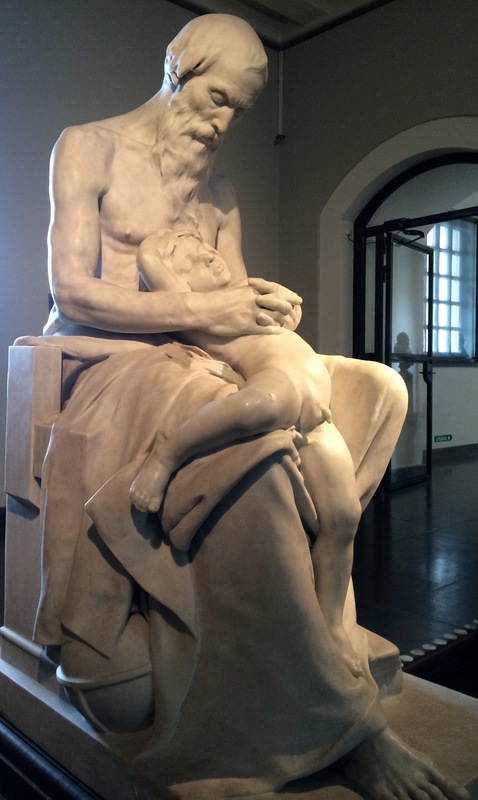 Per Hasselberg’s (1850-1894) “Grandfather”; no explanation needed. and Monika Larsen Dennis’ (1963- ) shows what Auguste Rodin’s statue “The Kiss” could be if the man and woman just left their impressions. After two hours we left for another part of the city, the Haga, where the Dutch workers (mentioned at the beginning of this post) lived. Now it’s a happening place, thrumming on this beautiful summer day with strollers, shoppers, and al fresco diners.